UPDATE: Since we published this post late last night we've learned more from a PorschePurist reader who works at the dealership. You can read their blow by blow description of this accident in the comment section below. Getting into a wreck in one of my Porsche is a worry that sits in the back of my mind and one that I hope I never have to deal with. I love my Porsches and I would never want to see them damaged or endure personal injury from an accident. That's why when I saw the picture below it struck a cord with me. Apparently a people mover (I'm assuming this is a bus a reader who was present at the scene informed us it's a minivan) was traveling down the road next to the Porsche dealership in Epsom, New Zealand (near Auckland) when for some reason it attempted a U-turn. As the bus turned it rammed a passing truck causing the driver of the truck to lose control and crash into the Porsche dealership. According to the reports I read, two people were injured (perhaps one seriously) and nine "luxury cars" (a number of them Porsches) were damaged. Police at the scene have said that "after hitting the people mover the truck "collected" a tow truck which had a car on the back of it. 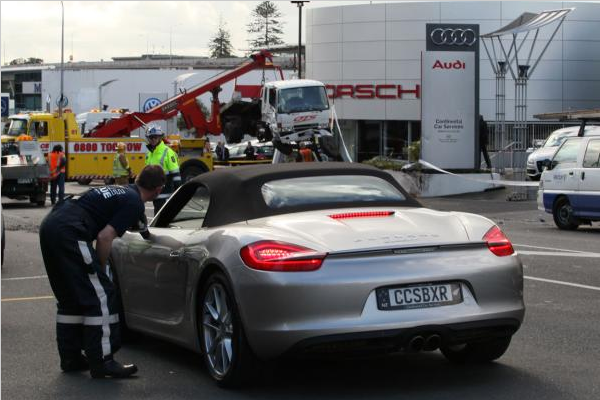 The truck pushed the tow-truck into the Porsche dealership "where it has hit a few Audis and Porsches along the way"." The officer went on to say that the people mover had also hit a few BMWs before coming to rest. One witness on the scene, Brian Cox, said it was like "the Dukes of Hazard". "I heard a massive great bang, I looked up and there was carnage everywhere," he said. Hopefully the injuries aren't as serious as reported and everyone involved recovers quickly! Are Porsche Accidents on the Rise? Will your Porsche Survive the next big Natural Disaster? 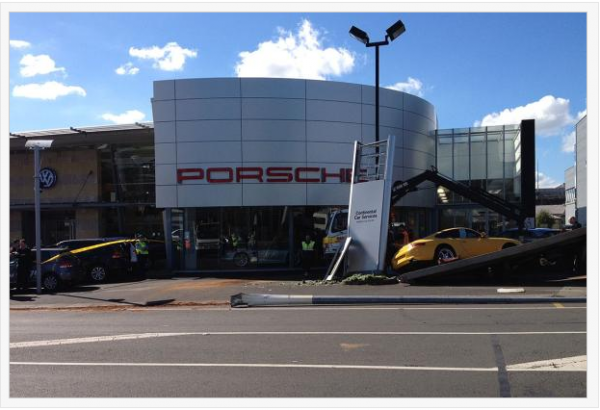 I work at the above dealership in Epsom an was on the Porsche forecourt just metres away from the carnage. The ‘people mover’ is not a bus but a 7+ seater van. It turned in font of a truck and trailer unit carring tonnes of concrete debris from the construction site behind the dealership. The truck and trailer unit driver lost control and crossed the centre line hitting a large tow truck. The tow truck driver was loading a Holden Barina (small hatchback) onto the tow truck and was in the car at the time of impact. The two trucks locked together and hit two Audis in the Audi dealership, hit a concrete retaining wall ripping out the front axle of the tow truck, carried on into the neighbouring Porsche forecourt where the Holden fell off the tow truck (with driver inside) the tray of the tow truck has scooped up a 996 Carrera 2. the Holden has hit the Porsche brand sign which collapsed in pieces on the ground. The whole lot stil moving has taken out a parked BMW 3-series, and hit a second car on the Porsche forcourt, a 996 Turbo Cabriolet. I heard two bangs, (the impact with the people mover, followed by the impact with the tow truck) and looked up to see the truck and trailer unit riding the tow truck through our Porsche forecourt. I was just 10 metres away. It was like a slow moving train wreck which just never seemed to stop. The crash took out a power transformer which cut all power to the Audi dealership for several hours. The street was closed for several hours also. This is a busy street with lots of pedestrians, buses, customers and staff often using the areas where the accident occurred. It’s amazing noone was in the path of the carnage as it unfolded. Only the people mover driver and the truck and trailer unit driver were injured, All other vehicles were unattended except for the tow truck driver in the Holden who was uninjured but shaken. Thanks for the update and glad to hear that you and others are mostly okay!! Will the dealership be closed for a bit now or will work continue through repairs? We had one of our techs move there just a few months ago…. it wouldnt have happened if they drove on the Right side of the road….. The Porsches were not destroyed, most of the other cars were suffered more damage than the two 911s. That comment is from another web-site that basically stole this story, your comment and then changed the headline! Unfortunately, it happens all the time. 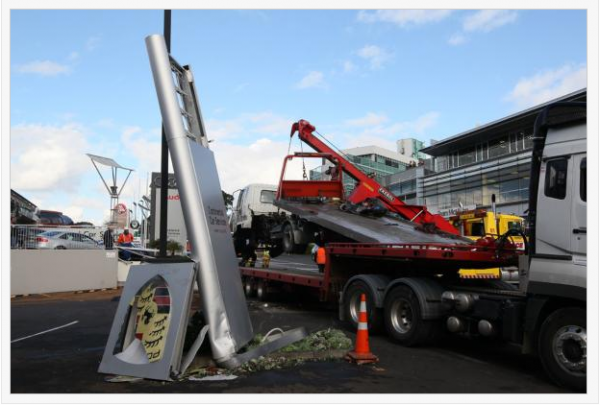 It turns out that the people mover (minivan) got airbourne for about 10 metres, bounced over a rock garden, took out a parking sign, and hit a BMW X3 parked outside the BMW dealership across the road, coming to rest in the middle of a side road. This was some distance from where I was standing so I didn’t know about it until speaking to co-workers yesterday. That makes 10 damaged vehicles in total. What is the speed limit at that location? Was it violated? Sounds like somebody wasn’t behaving properly…could that be possible in NZ? I would say the driver attempting the U-turn probably needs his head examined. That’s where the whole incident started.